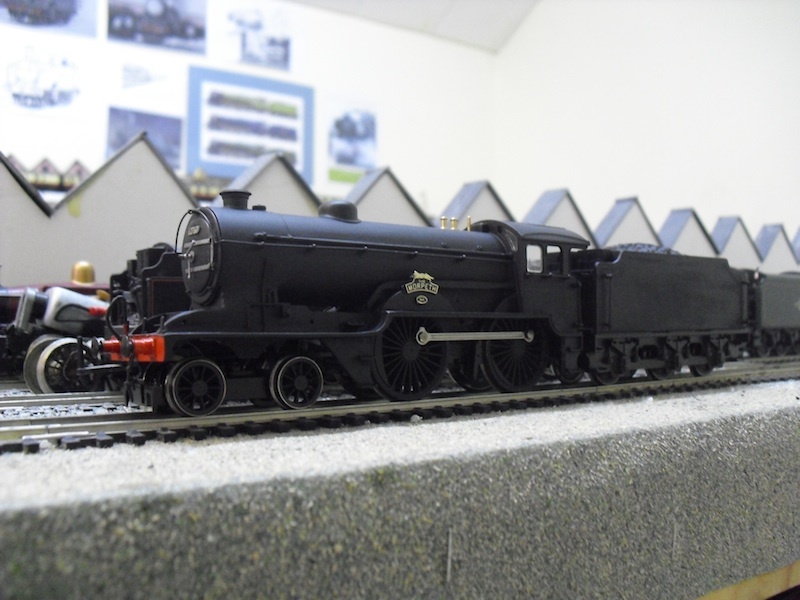 "Thompson A2/2 build - 60503 Lord President"
Whilst I wait for the transfers for 62678 The Morpeth to arrive, I have been working on another conversion, this time using a set of Graeme King's superb A2/3 resin castings - you can inquire about their availability here - to create a Thompson A2/2 using the Bachmann Peppercorn A2 as a basis. 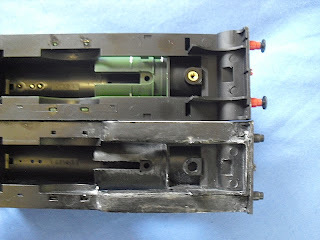 The original Bachmann valve gear has been carefully remove, and the chassis filed down in the necessary locations to fit the conversion components (seen in the milky white colour). 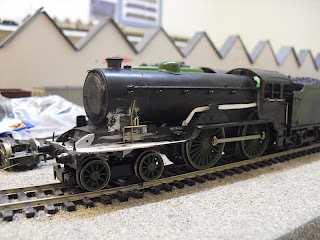 The front bogie has been test fitted using a bit of Pritt Stick to check spacing, and the same goes for the chimney and front extension ring for the smokebox. 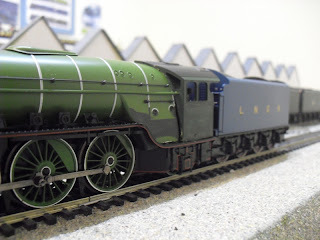 The cab comes from a Hornby Railroad A4 Mallard bodyshell, which was going spare after a few wins of spare parts on Ebay. 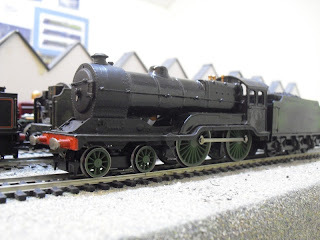 The cab was simply cut straight from the bodyshell, and filed back to fit, whilst the boiler of the Bachmann A2 was modified to fit. 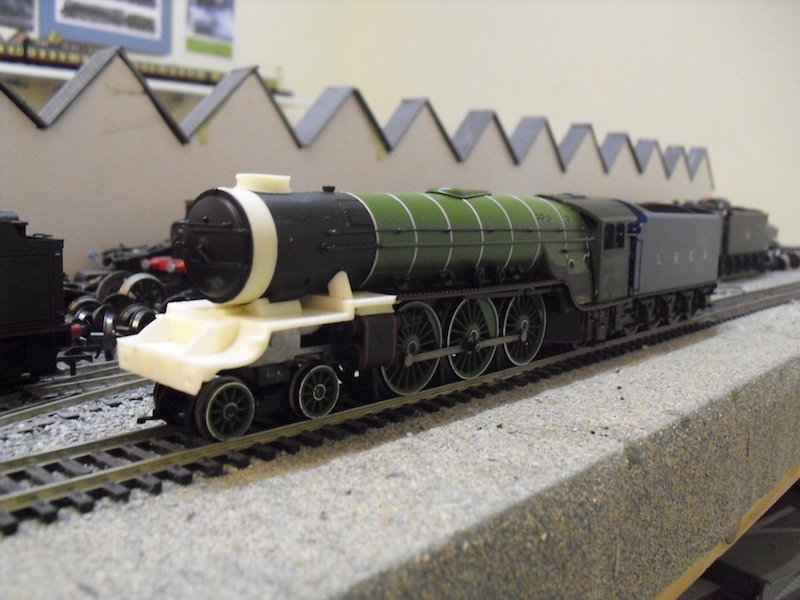 The tender was a surprise win on eBay for £20. 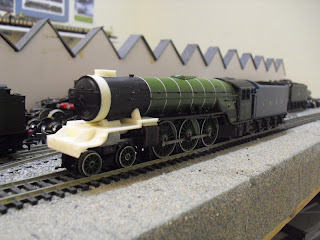 It's the super detail Mallard tender from Hornby and is perfect for this conversion. 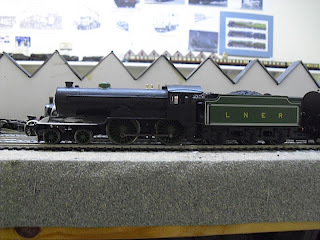 I take my cue from Mick who put up such a splendid "how to" of his A2/2 build here, and on the LNER forum. The boiler has had a few modifications done, but there's a lot more jobs to do including, but not limited to, removing the washout plugs and replacing with correct shaped ones in the right locations, and removing two boiler bands and installing one to match the original style of the boiler cladding on the A2/2 I am modelling, namely 60503, Lord President. 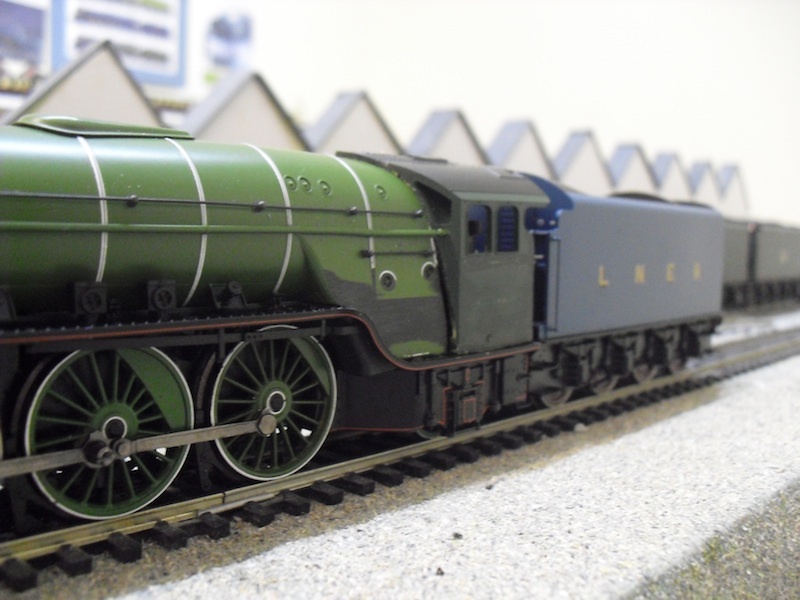 This locomotive is destined to be in a filthy LNER livery, as it was in 1949 prior to overhaul and repainting in BR Dark Green with the cycling lion emblem. 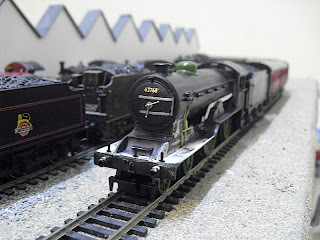 It had been allocated to Leeds Neville Hill for a short time (there were problems with with a few of that shed's Pacifics at the time) and was used on trains into London King's Cross. My excuse for running 60503 on my layout, is that it was borrowed to work a train into Leeds Central and has been coaled/watered at Copley Hill before working into London to work back to Leeds Neville Hill! 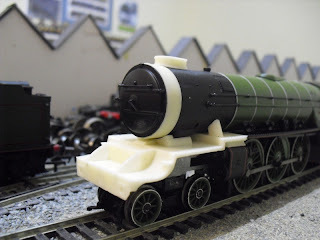 I'm thoroughly enjoying the build thus far, though I know that the simplistic adapation of the Bachmann A2 valve gear using standard Bachmann V2 components won't be as attractive as the etched Comet conversions which Graeme and a few others have undertaken on theirs. In my defense, I'm not as skilled a modeller as they are, and will be happy with something which runs for the moment, until I can learn and build up the necessary skills that will allow me to replace my crude alternative. I was initially nervous about chopping up a £100+ model but the conversion is going together so nicely that I feel much happier at having a go myself. 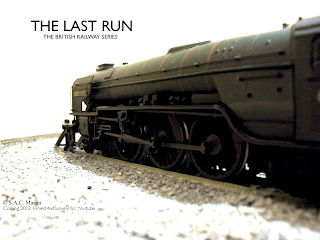 So much so that I am certain an A2/3 conversion and an A1/1, again using Graeme's superb castings, will follow later this year. 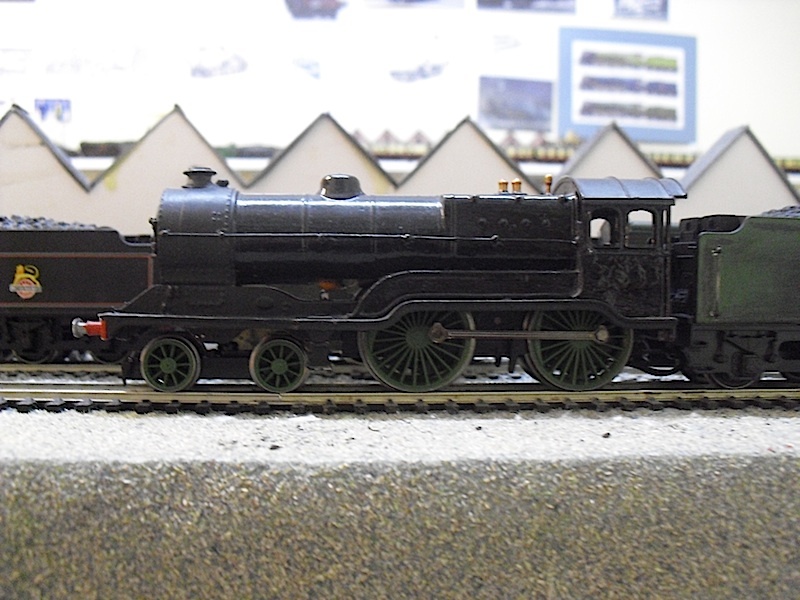 60503 is my project for February and destined to run at a friend's church fair on his small end to end later this year, so I'd best get cracking when I find the time after work this month. There will be changes to the blog over the next week. Watch out for the new look! 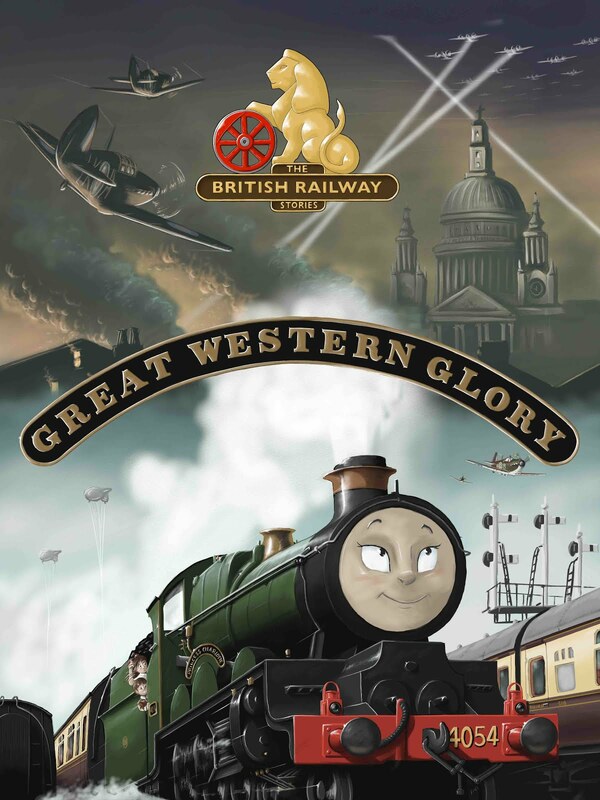 A few years ago, on the suggestion of a close friend, I ran a competition for charity where the prize was a print of the three main characters of The British Railway Series. Well, I resurrected the idea in 2011 and commissioned a Christmas portrait of the main characters on shed at Copley Hill, as a prize for the Facebook group's Christmas Art Competition (which was a rousing success). 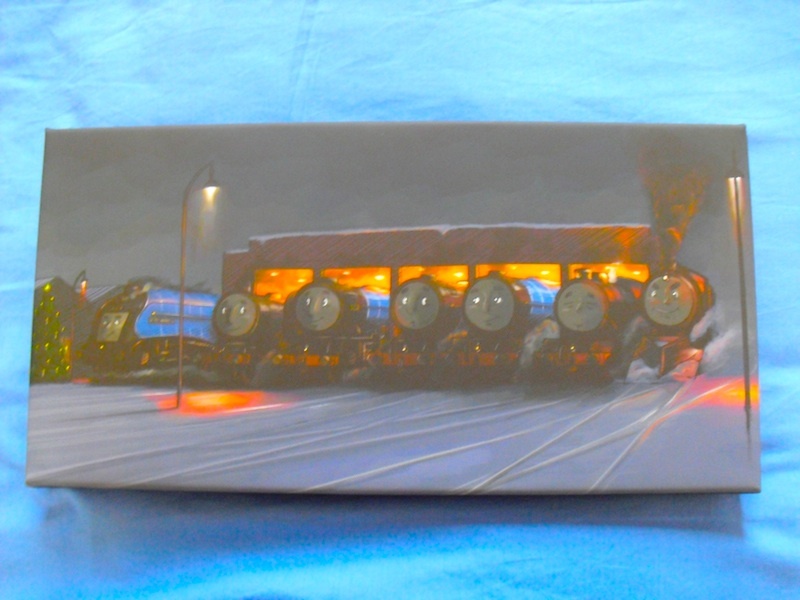 The above photograph shows the stunning result, which will be sent up to Newcastle on Friday for the artist to sign, and then send onto the BRWS Facegroup winner. We're getting there with 62768! I've put it into a black matt coat, and will varnish the areas where there are to be transfers applied. The camera does show up a few areas to sand down again - the steps, for example, so we're not quite ready to shout "finished!" by any means. This is where we were a day ago, with the model unpainted and with the steps, new buffers and bufferbeam detail newly added. In hindsight I should have sanded it down more, but that can be done when the Archers rivets arrive next week in the final stages of the build. 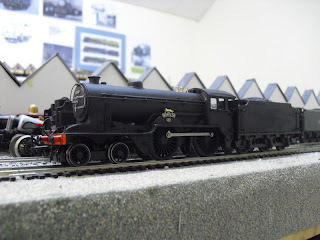 I sprayed the body the same matt black I applied to the tender, and have temporarily fitted the the nameplates, worksplates, safety valves, whistle and cab glazing to get a feel of how it is going to look when finished. I'm much happier with where I am with it this week than I was last week. 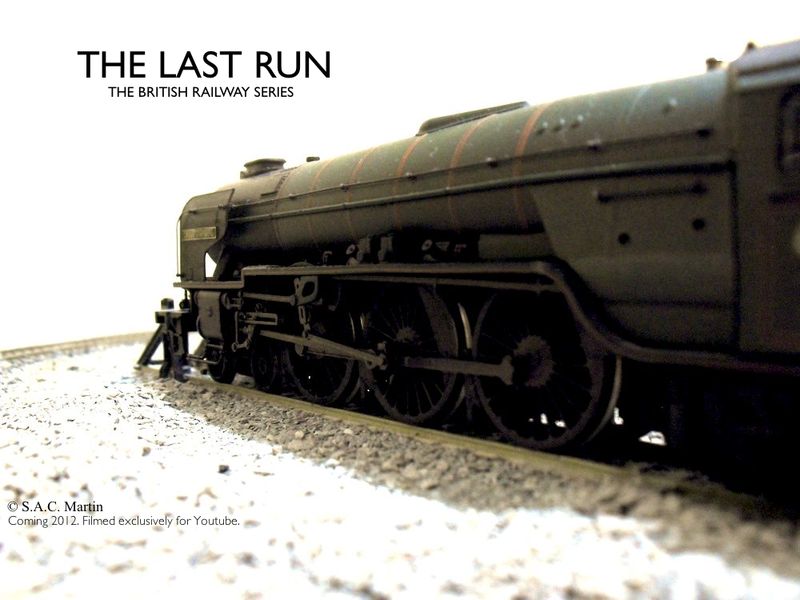 Working away from home has meant that modelling time has been very limited, almost to a few snatched hours at night on a Friday or Saturday before trudging back to High Wycombe in the car Monday morning. Is it a perfect recreation of the lone Thompson D Class? No, definitely not. Is it a decent representation? I think so, in so much that as a budget conversion, it's the best I could do currently, though hopefully lessons learned from this build can be applied to the next couple of ready to run conversions I have planned. Next jobs are addition of the rivets, sand down the steps carefully, and repaint areas required, before applying the transfers, weathering and sealing the finish thereafter. So, a small update on a project I am thoroughly enjoying. Very minor update today, I had a go at modifying the smokebox door to better represent the lone D Class 4-4-0 as I am intending to portray it. Namely as British Railways 62768, with full mixed traffic lining out but with the early lettered branding as opposed the cycling lion on the tender. Next jobs to do are rivets, steps, buffers, front coupling, painting, lining out, weathering and sealing...! While researching and writing new stories for my books, I came across on an internet forum an absolutely beautiful photograph from the late 1940s. For copyright reasons and with respect to the owner of the photograph, I won't reproduce it here, but the photograph was screaming out to be developed as children's story (and indeed, on the forum one user commented rather favourably in this vein). The photograph concerned showed British Railways A2 Pacific Happy Knight on a train going through Grantham station. There on the bufferbeam, in small Gill Sans lettering under its number are the immortal words "Copley Hill", for it was allocated to Leeds Copley Hill in the late 40s. The Peppercorn A2s left in 1949 and 1950 and were allocated further up north, mostly in the Scottish region, thereafter. The idea of Happy Knight being an unhappy knight - and as to why - perhaps tying into, as suggested, "why that name" (it was named after a racehorse in reality), and perhaps playing on it somewhat to induce a moralistic story, appeals greatly. 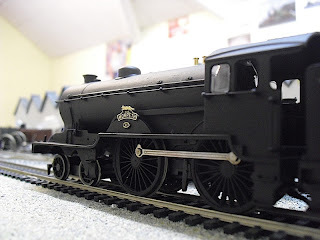 Plus, it's another excuse to add one of those fabulous single chimney Peppercorn A2 Bachmann models to my ever growing collection, one day! British Railways no.60114 rests at Copley Hill Leeds. Dean Walker. It's not very often that I feel I need to sing to the high heavens on - well - anything! But on seeing this portrait drop into my email inbox, I needed to reiterate once more, with a cropped and slightly edited version of the whole artwork (so that the story itself is not revealed), just how good the artwork for Tale of the Unnamed Engine is turning out to be. I have so enjoyed going through my emails, reading up on how much some of you are looking forward to the book, so I'd like to offer my apologies for not being able to respond to everyone individually, and to say thank you for your continuous support. 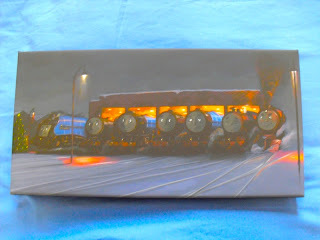 2012 I hope will be the year of The British Railway Stories, and I will do everything in my power to make it so. There's so many stories still to tell, and fresh ideas being found, recorded and developed all the time. So, to those of you on Twitter, Facebook, Youtube, Blogger, and who may be writing in by email - you have my thanks and gratitude for your support. Just a little update this evening, began adding details to the Thompson D Class, as well as preparing the tender for repainting, and modifying the smokebox door so it is ready for some plasticard bashing into its required form later in the week. The chassis was due to go into the paintshop today but I ran out of time. C'est la vie! Not a million miles away, you know. Very interesting development, and a second D49 may be on its way shortly. 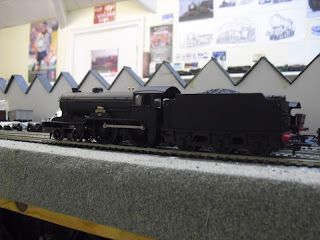 Where I am going to get the GCR tender from, mind, is anyone's guess! First modelling post of the new year! So what's in store today? 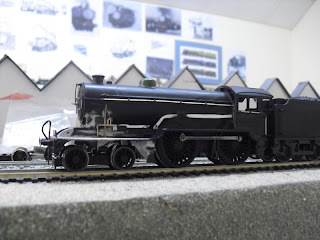 Well, the Hornby Railroad D49 model I had ordered arrived last Friday, but today was the first day I had to get a look at it. 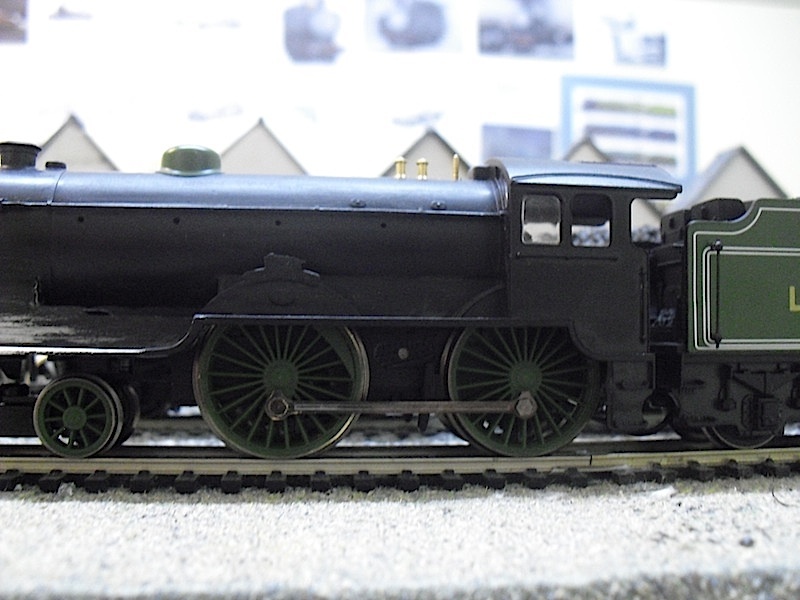 The model was taken out of its box, and promptly taken apart for the first stage of its transformation into a Thompson D Class 4-4-0, The Morpeth. The driving wheels were removed by carefully taking off the chassis plate, and uncoupling the tender from the chassis by removing a screw. 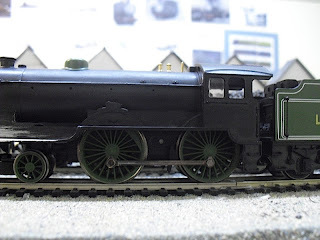 The front driving wheels had their crank pins removed in favour of a different set, allowing an inside cylindered 4-4-0 as opposed an outside cylindered one. The driving wheels were then replaced, and the keeper plate screwed back on. The result: as below, a working inside cylindered 4-4-0 chassis! 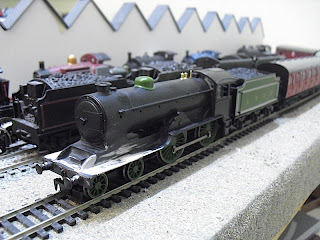 You will recall I had started modifying a spare D49 bodyshell before getting the Railroad model, in a previous blog post. 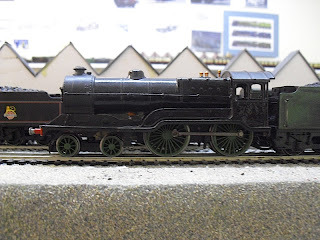 I had though it would be a simple enough switch between the two, however the one and only modification you need to make to the original style bodyshell is to widen the cab in the boiler to match the Railroad one above (although mine has not actually been filed out to the full depth, instead a bit of trial and error has allowed comfortable placement on the chassis). The cab glazing, safety valves, whistle, dome and smokebox door have all been removed from the Railroad D49 to donate to the D Class bodyshell I had been working on. 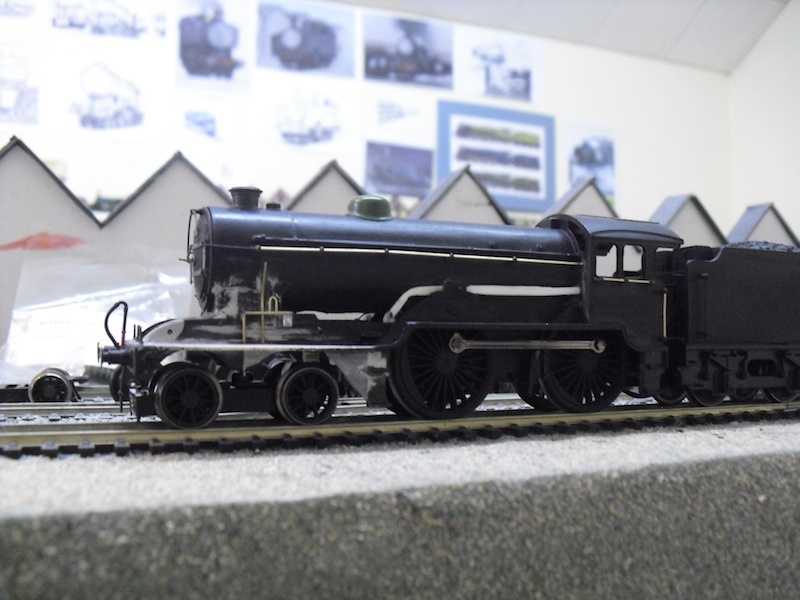 I hope you'll agree, the model is looking much closer to being a Thompson D49 now! I'm really pleased with it at present. Still a long way to go, but it's a lot closer than it was, and it does prove the theory somewhat that you could "do a Thompson" and rebuild a D49 in this vein. The only thing I'm not happy with are the traction tyres, but they are surprisingly discreet and haven't shown the problems with traction my 4VEP had shown previously. Until next time, when I hope to have fully finished this model (adding regulator, rivets, piping, buffer details, sprung buffers, handrail, etc etc). In what livery it will appear, I haven't yet decided...!